This year we will have a team of 12 travel to Costa Rica. This team represents Executive Directors and Habitat staff/volunteers from around the State of Texas. We are please to announce our following team: Gayla Fullerton, Amy Ledbetter Parham, Steven Leggett, Chas Massey, Laurie Mealy, Clay Parham, Nathan Weir, Andy York, Austen Zoutewelle, Nathan Touchette, Addie Keller and Celeste Cox. Here’s some information about Costa Rica and Habitat. The INEC National Survey of 2014 estimates that at least 1.2 million of Costa Rica’s residents — about one-fourth of the population — live in poverty, and 6.7 percent of the inhabitants live in extreme poverty. Among poor households, 7.8 percent have single women as heads of the household, which makes it difficult for them to access credit to secure adequate housing. Although the state helps alleviate social housing problems through a solidarity subsidy, the process to access this subsidy is not always a good opportunity for the families who need it. Additionally, the scarcity of access to credit for adequate housing affects the lowest-income segments of the population. An adequate and permanent house is carefully designed, built with good quality materials in a safe property and inhabited with values: respect, support, communication, faith, honesty, collaboration and harmony. 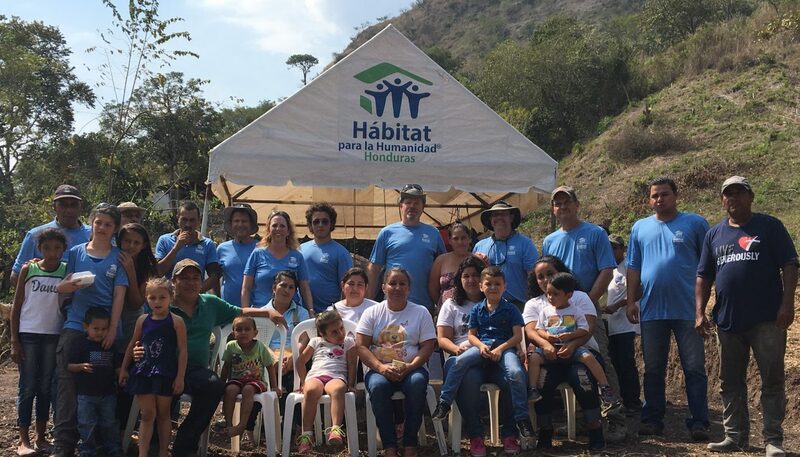 Habitat for Humanity Costa Rica pays attention to the quality of construction and expects that each house that carries our name becomes an inviting place for the family to share. Improvements: In 2013-14, we performed 76 home improvements and rehabilitations, which have a positive result in the community as a social entity. Training for life: Last fiscal year, 276 families received Construction Technical Assistance, and 4,534 individuals in different areas were provided with pertinent information to gain access to the state housing subsidy. In addition, 569 individuals received financial training to learn to adequately interpret their financial reality and efficiently manage their resources. Volunteerism: Throughout the past year, 622 national volunteers donated their love and solidarity, providing 4,976 hours of volunteer work. Additionally, international volunteers reached a total of 16,200 hours of volunteer work in the housing projects of Biolley and Potrero Grande, along with other individual households in the southern region of the country. Osvaldo (center) and his mother. To improve the housing conditions of Osvaldo Ramirez, a boy who has a skin disease called severe atopic dermatitis, Habitat for Humanity Costa Rica and the National Golf Association partnered to hold the fifth Solidarity Golf Tournament, titled “Let Us Build,” in the Costa Rica Country Club in Escazu. The proceeds were dedicated to a complete repair of Osvaldo’s house, which now has a ceramic tiled bathroom, optimal lighting with skylights and new windows, a safe electrical system, a new roof cover, gable walls, gutters and renewed beams, external and internal painting, ceramic tile floors, and PVC ceilings. Additionally, a water tank was installed to guarantee the safe water that Osvaldo needs to minimize his condition. The family, including Osvaldo’s mother and four other children between 17 years and 3 months old, is a testimony of what can be reached when you bring together the will, the effort, the responsibility and God’s love in action.